Tagged under A-1 Pictures, Series. Full title: Ano Hi Mita Hana no Namae o Bokutachi wa Mada Shiranai ("We Still Don't Know the Name of the Flower We Saw That Day"). Quite a charming and heartwarming series and I like the friendship story it has surrounding the main characters and certain parts pang at your heart, especially during the tense scenes. Naruko is my favorite character of the bunch, she's quite interesting and has a gorgeous character design. The ED song is really good and the trio of seiyuu who voice the main girls of the series did a great job with it and the song brings tears to your eyes. Overall, I'd say it deserves it's popularity and I love the Easter eggs peppered into the series itself, like at the store Naruko works at with posters of shows like Working!! and others shown. I watched the follow-up movie and I wish it gave more on Anaru (Naruko) and Tsuruko (Chiriko) being able to truly express their feelings to the ones they love to give better closure to the series. 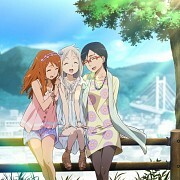 "Anohana: The Flower We Saw That Day" is that kind of anime that makes you LOL at first sometimes but the in the middel and end it makes you CRY so much! IF YOU DON`T SHED TO TEARS YOU ARE A NON-HUMAN ROBOT! 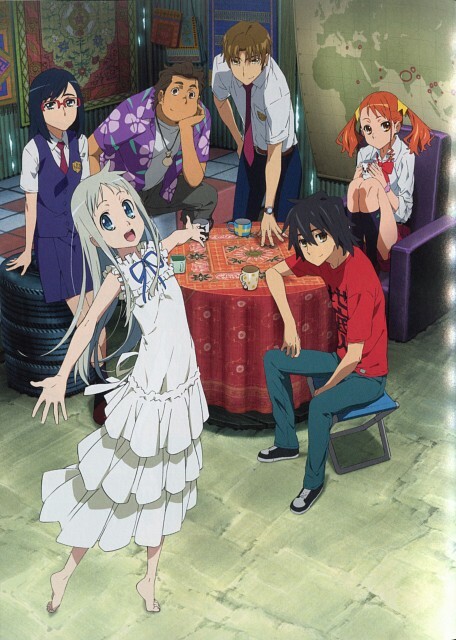 It´s about a group of childhood friends thet drift apart after one of them, Meiko "Menma" Honma, dies in an accident. Ten years after the incident, the leader of the group, Jinta Yadomi, has withdrawn from society and lives as a recluse. Her spirit apears to him and asks to grant her wich...bue since Menma does not remember what her wish is, Jinta gathers his estranged friends together once again, believing that they are the key to resolving this problem. 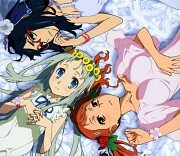 But hidden feelings and internal conflicts keep them and Menma from moving on. I LOVE YOU MENMA! Super Peace Busters 4 Ever! I love these types of stories (to a point). I wish it had a little more 'happier ending' of sorts but I do love how there is a lot of feeling, effort, and meaning put into it as well as the characters. Most of the characters I really liked, and I did like how it was a bunch of old friends working through things to get back to their strong bond they had in childhood before a terrible tragedy occurred. Things may never be fully the same between them but they are trying. I heard about this anime from a friend and there were so many positive feedback about this show that i had to watch it myself. This show is beautiful, quite touching, and emotional. It is quite a sad story but I went through the entire anime without shedding a tear. So many positive reviews of this short 11 episode anime and now I know why. Simple art and characters but strong emotions are build up with every episode that goes on then then truths start shooting out straight to the heart. No complex over the top ghost story, just emotions and feelings left untold and now a chance is given to convey them. I absolutely enjoyed it. What can I say, you end up building a relationship with all the characters, really get to know them then at the end (if it hasn't already gotten you [did get me]) BAM!, water works cause of what's happening. Just an amazing anime for only 11 episodes. I almost dropped it at first but I'm really glad I finished it!!! it got me crying at the end Q-Q I think ti's one of the animes that I'd like to go back and re-visit again sometime. Wonderful plot and animation. I loved it since I read the summary: childhood friends that reunite to fulfill a special mission for an old friend that just happens to be dead. Due to the outstanding drama and love pentagons, each episode is full of emotions and very well designed to lead us to a perfect, and so respectable, ending. I felt sympathy for each character, understanding the reasons for some strange behaviors during the story, even though some personalities were opposite in so many ways. Wow. This anime had everything, but ,man, it was really sad. I looked at some reviews before I started to watch this and everyone of them said that it would be a tearjerker. They weren't kidding. If you know me then you know I don't tend to show very much emotion around anybody, but this show tore me up. It wasn't even the entire show either it was the last 5 minutes that just put the cherry on top of an already sad story. The notes just took my soul and crushed it. I mean that made me sit for a while and think about stuff I think about all the time but at a different angle. This ties for my favorite anime ever because you learn from it. I'm gonna rewatch during summer break. If you haven't seen this and you're not sure of what to watch next, watch this. The first episode reminded me of three of my favorite anime : Toradora (for the story, and the characters design), Clannad (for the strong emotions underlying the story line) and Kanon (with the importance of the childhood memories of the hero in the storyline). Well-written, the first episode left me with a strong urge to time-travel to the next week in order to watch the 2nd episode. The mystery around Menma and her wish hooked me, and the shared past of the main characters take us through a journey rich in emotions. Although the series is far from perfect, what I enjoyed the most was the very realistic depiction of the feelings of guilt and regret after a traumatic experience. I would watch it again. It has a very moving story, this anime personally loved it, enjoy both the story and the openings. Not suitable for cardiac people XD! Another tear-jerker series. This show was unique, in my opinion. A group of teens are haunted by their past where a friend of theirs died and they all went their separate ways. The ghost and memory of the friend brings them all together only to have to say their final goodbyes to her. I see Meiko, the "beast of summer" as a gateway for her dear friends to gain forgiveness, love, and peace to live again and move on from the painful past. I like the character designs. The OP and ED are nice. I like the story of a girl's spirit wanting to find peace through bringing her friends together once they drifted apart because of her death. And how her death affected each of those 5 friends left behind and the feelings each of them had been hiding as a result. The ending was sad.